Reservation is creating division in society, it is a tool for politically aspirants person to implement the British policy of DIVIDE AND RULE. Just think about the merit holder students/candidates who are from upper caste but their financial condition is weak and they are not able to get admission/job despite their hard work due to above mentioned VOTE BANK game of political peoples. Political leaders are damaging the future of country only for their own self benefit. Did any question is asked by any leader of any political party in Parliament / Vidhan Sabha / Rajya Sabha that why India has a Brain-Drain problem. “Sir, I am not a fool, why I will work under the command of illiterate and corrupt leaders after getting my degree”. The above incident shows the thinking of young minds or we can say the coming generation is losing faith in the system of their motherland. The best of India Brains work for the development of foreign countries. In USA most of organizations search for Indian Doctors and Engineers because they know that best brain left their motherland due to DIRTY VOTE BANK POLITICS. Reservation system should be modified so that any merit holder student/candidate may not left the country and inspired to work for the betterment and development of Nation. 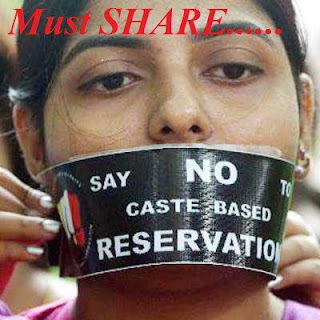 The system of reservation had been created in view of inequality in society for a limited period but even after expiry of that period it is not finished but extended to so many groups/castes due to VOTE BANK POLITICS of political leaders. Recently Haryana state has seen so much agitation for demand of reservation and we cannot forget other agitations in different states like in Gujrat, Rajasthan etc. In last 60 years the structure of society has totally changed and previously who is weak and poor is now stable and wealthy due to reservation and the able people are weak now means social structure reversed which is making a very very bad impact on society and humanity. Their should be no compromise on quality of work/merit. Just think about different in quality of treatment given by a 50% marks obtained doctor and 90% marks obtained doctors. Also think about the difference in strength of buildings constructed by 50% marks obtained engineer and 90% marks obtained engineer. This difference will applies in every field and only due to reservation our country is behind the many foreign countries. In interest of the nation RESERVATION must be finished and only those who are talented and merit holders may move forward and financial assistance may be provided to them if they are financially weak.